We’re in the middle of London Fashion Week and we are LOVING IT. New York Fashion Week is great and all but it’s very classy, Milan is very bling and Paris, well it’s Paris, so it’s super chic. What London offers, that no one else can, is an insane amount of creativity, nothing is out of bounds. Case in point, last night’s Gareth Pugh show where MAC make-up artist Val Garland delivered over-filled cheeks with some tight elastic and L’Oréal Paris hair stylist Malcolm Edwards built huge horns of hair around glass tubes. See, unparalleled creativity. Boom. And so, to Mary Katrantzou’s AW16 show where she returned to her old haunt Central St Martins in London’s Kings Cross. I accosted hair stylist Duffy (the man needs only one name) backstage where he was busy at work an utterly genius hair design. He told me, ‘The collection is covered in stars and hearts so we thought we would incorporate them into the beauty look. The hair that I have created is styled around the shape of a star.’ Yes! Armed with L’Oréal Professionnel Tecni Art Glue Crystal Fibre Gel and L’Oréal Professionnel Tecni Art Pli, Duffy split the hair from the crown into the severe sides of the tip of a five-point star. With a hair colour brush, his team painted the glue over the two sides of hair, pulling it down and onto the forehead before turning it sharply at a right angle and pulling it towards the top of the ear; the impression from the front was of the top half of a star. The straight edges were made easy with a pair of chopsticks, a borrowed trick from fellow stylist Eugene Souleiman. Does it really get better than that? 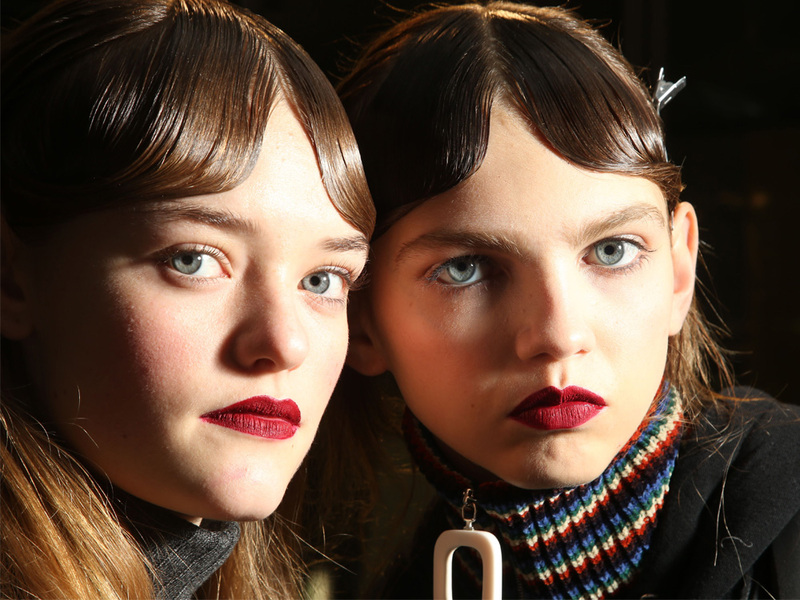 The only thing that could make this better was the softest, velvet burgundy heart-shaped lips crafted by MAC make-up artist Lynsey Alexander. 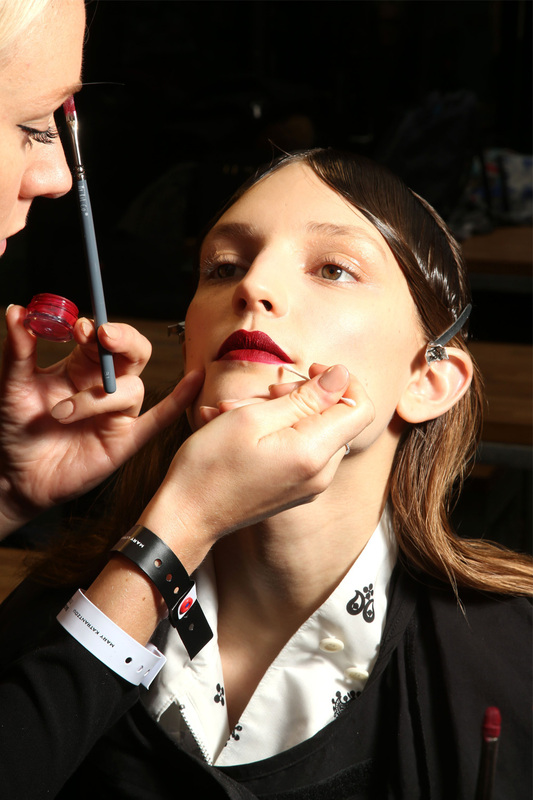 First she lined the lips and filled them in with MAC Lip Pencil in Burgundy before coating that whole mouth in MAC Retro Matte Liquid Lipcolour in Dance With Me. And with that, Mary K had us all starry eyed and seeing hearts.